Want to be notified of new releases in dtheasby/webdriverio-examples? When it comes to automated UI checking, there is a complex variety of tools at the disposal of the Tester; including Technologies, Test Runners, Test Frameworks, Cloud Services, Reporters, and CI Systems. While the project itself may dictate a small selection of the combination above, choosing the remainder and getting them to play nicely can be a time consuming task. Webdriver.IO is a Node.JS webdriver library and test runner designed to simplify the testing process, with support for the most popular test frameworks, cloud services, CI Systems, and Reporters out the box - for more info see Webdriver.IO's Getting Started Page (and here for a [loosely] relevant xckd). This blog post is written in an attempt to guide a new user through setting up webdriver.IO, automating the test workflow with gulp, and then expanding the tests to incorporate the page object model. The final product will see Webdriver.IO set up using Mocha and Chai as the test framework and assertion library, respectively, with the full project accessible here. All tests will be executed on a local Selenium server, with Gulp used to launch the server, run the test runner, and then kill the server afterwards(to keep things tidy), using an npm script command. 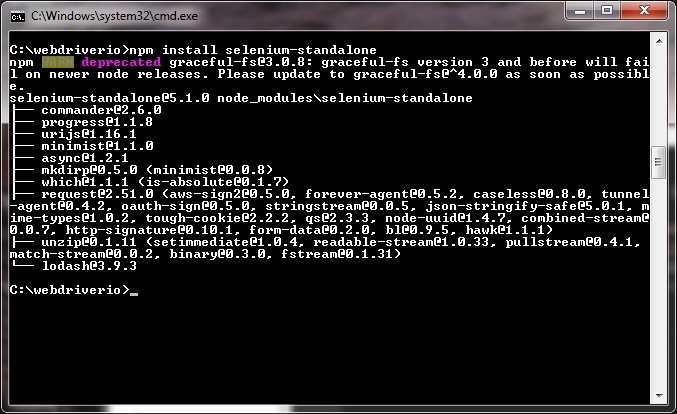 The once empty directory should now contain one new folder, node_modules, which will contain all the npm dependencies. 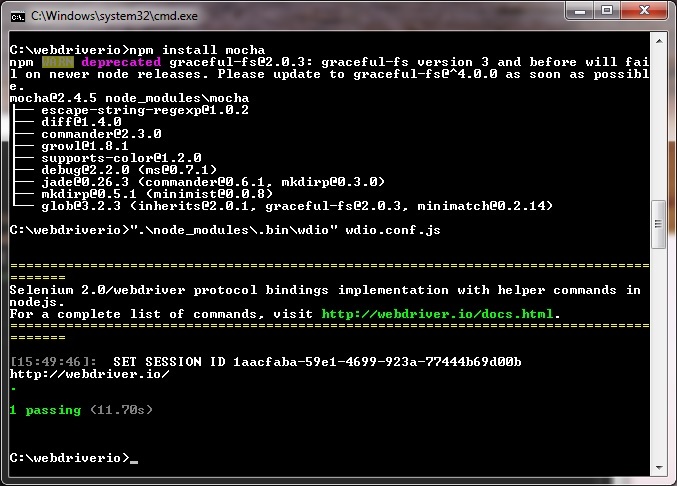 We’ve had to point directly to the ‘wdio’ command which resides in the node_modules folder, rather than being able to call wdio itself. This is a consequence of installing locally (the wdio command hasn’t been added to PATH), but this won’t be a problem once we set up Gulp. You can either set up your config file by running the config helper from your newly created test directory, or create your own wdio.conf.js in the root of your test directory and copy the above code into it. The main points to take away are that we now have a config file in the root of our test directory, which specifies that we’ll be running our tests on the local machine (using a local selenium server, as opposed to Saucelabs etc. ), we’ll be using Mocha as our testing framework, and the location of the test specs relative to the location of the config file. 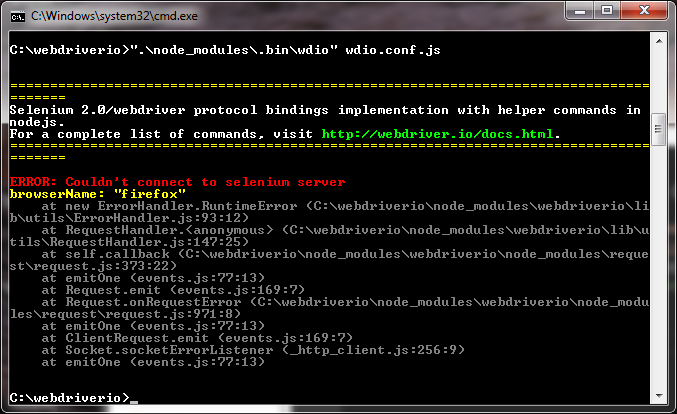 That’s good, no webdriver.IO specific errors have fired, and it has found our config file and tests/specs. 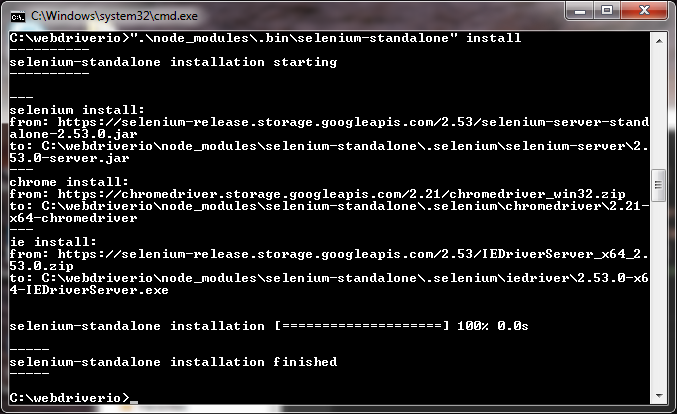 The next step is to deal with the rather obvious “ERROR: Couldn’t connect to selenium server”, and fix up a connection to the local selenium server. 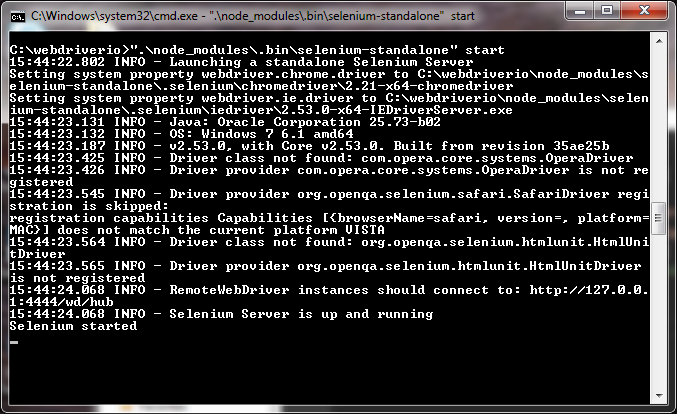 The Selenium server remains registered to the command window, so after launching a new one and returning to the test directory, we can try to a test run! Booyah! One running and passing UI test. Okay, so I guess that was the pretty long version of ‘Getting Started’, but we’ve covered all the basics and developed a solid foundation. Although, having to point directly to the wdio command and manually launch the selenium server when we want to run a test is a bit of a pain; so, let’s make it a bit easier to run our specs by automating the automation! Appending the command with “—save” tells npm to add gulp to the list of dependencies in the package.json file. Another package that will help us is gulp-webdriver v1.0.3 (to be compatible with Webdriver.IO v3.4.0), from the Webdriver.IO team. 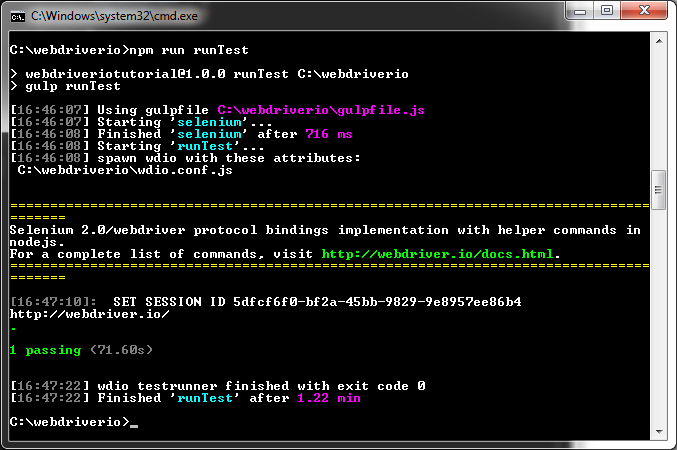 This package allows us to easily access the Webdriver.IO test runner via gulp. Which is the ‘gulpfile.js’, where the gulp processes are defined. This is located next to the wdio config file, in the root of our test directory. Both commands can take an options object before the callback, but we want to run with the default options, so we provide only the callback functions. Looking inside the selenium.start callback, we set the selenium child process on to the selenium object so it can be shut down later. However, it is much more maintainable to contain these in the external config file (futher info on gulp-webdriver and available options can be found here - Getting-started and gulp-webdriver). The final thing we need to do before running is set up an npm run script so we can access our newly created gulp tasks from the command line. We could run them via gulp runTasks, but as we only have Gulp installed locally we would have to point directly to the gulp command in our node_modules eg “./node_modules/.bin/gulp” runTasks, and using npm scripts is a much cleaner and easier method. From here, all we need to do is execute npm run runTasks to access the assigned gulp workflow. This works because the npm run command adds node_modules/.bin, our local dependency directory, to the shell’s PATH, allowing us to run Gulp like it’s installed globally! That’s it for setting up our workflow environment! Without gulp, each time the test were to run we’d need to (perhaps update) launch our selenium server, run our test scripts, and then kill the server. With it, we’ve automated this workflow, allowing us to run it all with one simple npm command. Continue on to part 2 for a guide to setting up tests and developing them in more maintainable way using the page-object model. Following on from Using Webdriver.IO part 1, where Gulp was set up to take care of the selenium environment setup and tear down, we should now have an easily accessible and stable test process. The full code for the end product can be found here, in case you want to take a look back at what's been done so far, or a little peek ahead at the final product. In the next section, we'll be looking at the tests themeselves, and implementing the page-object model. The test we have at the moment is a fairly straight forward, although with the lack of any type of assertion, can it really be called a test? 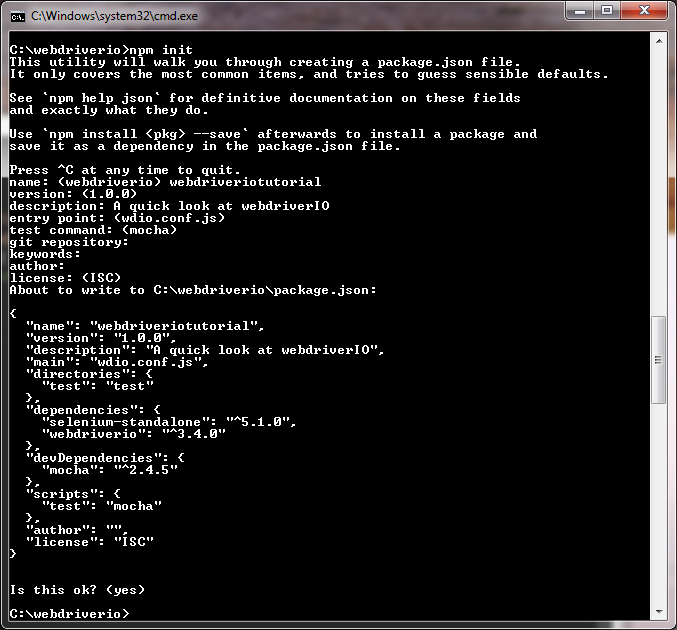 Let's crumble any doubt by installing an assertion library, such as Chai! Chai provides three different styles(Expect, Should, and Assert), that allows you to write syntactically delicious assertions. 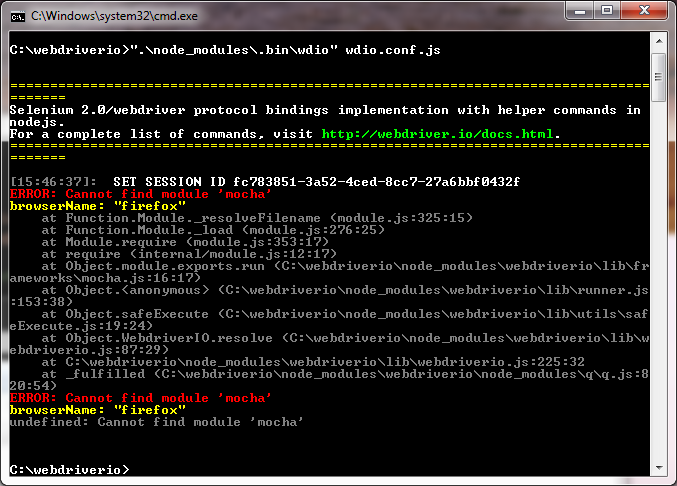 Webdriver.IO sets up the test hooks in it’s config file by default. Each hook is executed at different stages of the test’s flow, with the before hook running once per describe block, before any it blocks are run. Running this should present you with a passing test, so let’s take a quick tour of what’s actually going on. As we’re using mocha’s BDD syntax, each test suite and case is defined by a describe or it block, respectively. If you have eagle eyes, you may have spotted that the first thing declared in the it block is a return on our chain of Webdriver.IO commands. As the commands are executed on an asynchronous environment, mocha needs to know, explicity, when our browser commands have completed and assertions have finished. There are two ways of accomplishing this, either via the done() callback, or by having a promise returned. Furthermore, every Webdriver.IO command is chainable and returns a promise, making it incredibly easy to write synchronous code to test the asynchronous browser environment - by chaining the commands, each one waits for the promise from the previous command to resolve before executing, essentially queuing the actions sent to the browser. By returning this promise chain, mocha knows when the final promise has been resolved, and will wait for this before ending the test. Another advantage of using and returning promises is that we can avoid the numerous call-backs and error-handling code normally associated with using done(), making our code simpler, and easier to read. Every Webdriver.IO element interaction accepts a string which is used to locate the associated html element in the DOM. This string can reference the element’s ID, class, tag, or other (see selectors). The click command takes the browser object which has been returned from url, and the string locator we provided ([href='/guide.html']). It then locates this element, initiates the action, and returns the browser object with the click command’s promise attached. then waits for the promise to resolve, before executing the relevent callback depending on whether it resolved successfully or was errored/rejected. In place of "onfulfilled" we pass the function containing our assertion, with the result of the getUrl promise passed into the function upon resolution. Finally, Mocha sees that all promises have resolved, and the result of the assertion, ending the test. For further understanding of promises, I recommend this blog post here. At the moment, we’ve set up our tests to run with each element locator explicitly declared in the test itself. While it does work, as a project expands, readability and maintainability will start to become a big issue. For every change in the DOM, we’ll need to manually change each affected locator in the specs. Using the Page Object model adds a layer of abstraction to the test specs; by grouping together element locators into external modules that represent each page and exposing these to the test spec, we can both increase readability by giving our elements human-friendly names (guideButton, rather than [href='/guide.html']), as well as increasing maintainability via encapsulation. It doesn’t look like much at the moment, but I’m sure you’ll agree the test spec is definitely more readable. We set up a constructor function HomePage(), and publicly assign our element-finder strings to it, this is then returned by the IIFE and exposed by module.exports so we can access it from our spec files. Using the Constructor pattern means we can instance our page-objects, in case we want to run our specs in parallel at a later date. We then use require to access the page-object, assigning it to var HomePage. We create a new variable in the describe block, var home, and then use the before hook to create a new instance of the page-object before any of the ‘it’ blocks are executed. The current page-object works, but it is fairly straight forward. What if we want to include helper methods and manipulate data retrieved from elements in the DOM? Let’s create a second test that demonstrates this by navigating to the Developer Guide page of the Webdriver.IO site, and asserts that the Test Runner dropdown contains the correct number of links. which simply lets you search for elements down the branch of a specified element. The command takes the ID of a WebElement JSON object (not the CSS ID), and returns an object of WebElement JSON objects matching the selector provided. Using this, we can search for and return all elements that are children of the testrunner element. We’ve added getElementID to the prototype so that every instanced page-object gains access to it without it being re-declared each time. Webdriver.IO is slightly awkward in the way it deals with elements. We’re unable to pass elements around as first-class citizens*, so instead we must pass around the WebElement ID of the element in question, or string references for selectors and re-find the element when we need it. As a result, in a larger project, it might be beneficial to have getElementID as a generic helper function in a helper module, so that whenever we need to perform an action on an element we can easily call that function. Find all the child-elements match the <a> tag, and return the size of this object. Assert that the correct number of links are shown. That’s it! It’s a test that may not have huge implications in a real world scenario, but it successfully demonstrates how to surmount some of the minor difficulties associated with the element finder model implemented in Webdriver.IO. *Webdriver.IO released v4 from beta during the creation of this blog post. Improvements including treating elements as first class citizens are included, making Webdriver.IO another step easier to use. For more info, see their documentation here.